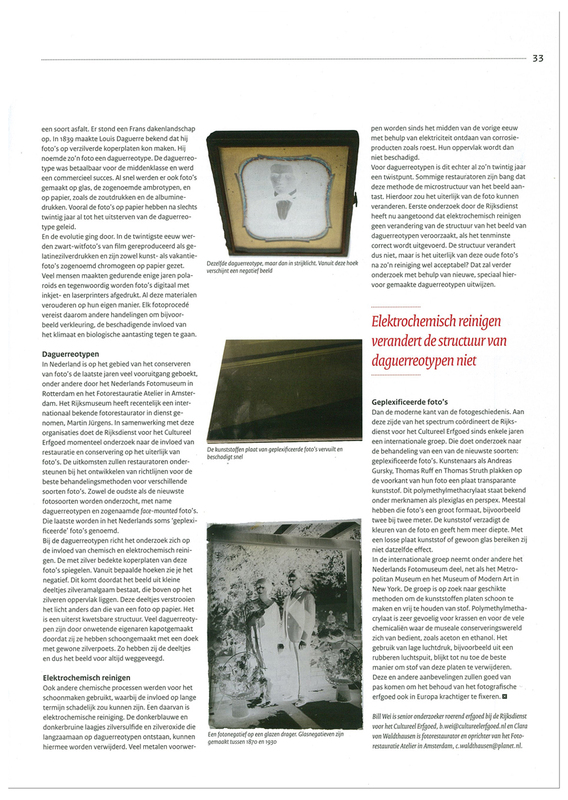 A friend of mine, Angelina Valleau, presented me with this article she found in the magazine “Tijdschrift van de Rijskdienst voor het Cultureel Erfgoed 3 2012”. It’s about the preservation and cleansing of different photographic materials. The writers are Bill Wei (senior investigator inheritance at the Rijksdienst voor het Cultureel Erfgoed) and Clara von Waldthausen (photo restaurator and founder of the Fotorestauratie Atelier in Amsterdam). The article remains pretty shallow and, according to what I’ve read about the past of photography, it even contains some errors. For instance, they mention that Daguerreotypes were the first type of affordable photography to become available to the middle class. As to my knowledge this is not the case. Daguerreotypes were very expensive to make, considering it was very time consuming let alone the silver that was needed to make the plates. Plus no form of reproduction was possible. 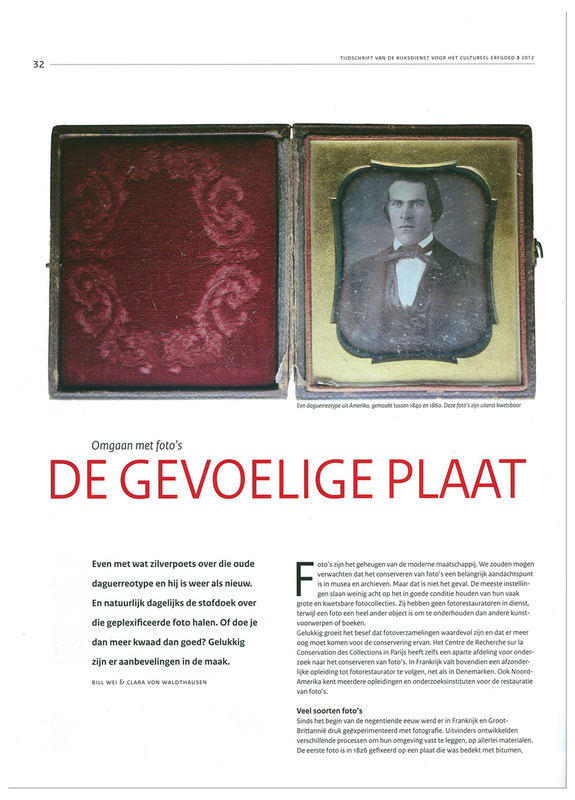 They mention that the upcoming of photos on paper were the foremost cause of death of daguerreotypes. In my opinion this was due to wet plate collodion photography that followed in the footsteps of the daguerreotypes, being cheaper to make and reproducible (clear glass = negatives). This is when photography became available to the larger audience. On top of that they mention that glass negatives have been made between 1870 and 1930. Again not the case in my opinion. They were able to make glass negatives starting from 1851 when the wet plate collodion process was introduced. That was also the time where “carte de visite” became popular (were invented even of course) because of those glass negatives. Maybe they’re referring to dry gelatin plates which were invented around 1871 but it would be nice to see that more accurately stated. If you want the article to come across as one with a scientific approach as that’s what restoration I thought is about I’m a little disappointed, but maybe someone feels it differently? Have a nice read anyway! This entry was posted on October 30, 2012 by Contrastique. It was filed under Books and was tagged with 2012, tijdschrift van de rijksdienst voor cultureel erfgoed.